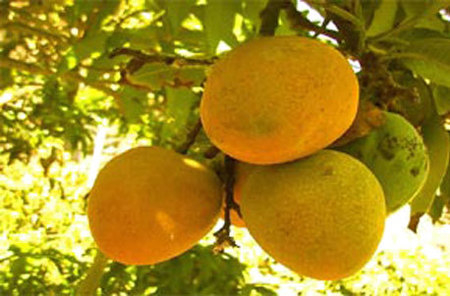 Have you ever heard of the huani mango? Perhaps most of us are not familiar with this kind of fruit, but the people in Zamboanga Peninsula know it well. Commonly called kuwini, Saipan mango, and fragrant mango, huani(Mangifera odorata) is a lesser popular Mangifera species that bears edible fruits. It grows to about 15 meters high, shaped like an open canopy through its large green leaves. Making it more attractive as an ornamental tree for home gardens are its large, red flower panicles. True to its name, the fragrant mango is characterized by its pungent smell. Its tree, as well as its flowers, emits a distinct odor that resembles a turpentine aroma. Some describe it as more sweet-scented as compared to other mango varieties. When ripened, its medium-sized rounded fruits have a bright orange to yellow flesh that is firm, slightly fibrous, yet juicy and sweet. In some parts of the world, it has gained economic importance, especially in areas where the Mangifera indica cannot be grown due to a very wet climate. Huani is usually consumed as a table fruit when ripe, while the green ones are made into pickles and sometimes used as condiments together with raisins, onion, and other spices. In traditional medicine, the bark of the huani is being utilized to treat people who are suffering from hystero-epilepsy, a form of hysteria that is accompanied with epileptic convulsions. Countries that are found to be planting huani include Indonesia, Malaysia, Philippines, Thailand, and Vietnam, among others. In the country, it is being cultivated in the fertile lands of Zamboanga Peninsula, and consumed mostly by our Muslim brothers. It bears fruits twice in a year, usually in areas that have two dry seasons. Peak season occurs from April to July, and during these times, the price of huani becomes very cheap. Moreover, it was noticed that some of the matured fruits are left rotten, and put into waste. To address these problems, researchers from the Department of Agriculture-Zamboanga Peninsula Integrated Agricultural Research Center (DA-ZAMPIARC), implemented a project that will help increase the crop’s market price, as well as reduce postharvest losses due to deterioration. Value-adding technologies and product development are seen as effective ways to address them. This prompted Ms. Norma Poblacion and Ms. Fe Sambulan to develop different products made out of the huanifruit. Funded under the National Technology Commercialization Program (NTCP) of the Bureau of Agricultural Research (BAR), the project seeks to process the huani fruit into wine, puree, powder, candies, and pickles that are hoped to be among Zamboanga Peninsula’s flagship processed foods. Through the project, the researchers will be able to: 1) determine the appropriate maturity period of huani that will produce the best products; 2) develop protocols for product standardization; 3) develop package of technology of the different products; 4) mass produce the products; and 5) push for the commercialization of the products. Currently, the laboratory building has already been renovated, and the equipment and processing facilities for the development of huani products have already been procured. The products that were developed out of the huani fruit have already undergone sensory evaluation to determine their acceptability in terms of color, smell, taste, odor, and aroma. The products which will be rated as the most acceptable will be sent for analysis at the Regional Standards and Testing Laboratories, Department of Science and Technology, Zamboanga City and Cagayan De Oro City.